Warren Howie reflects on what makes a good dad, and what is important to him. I became the father of a daughter for the first time in 1993 and the birth of my daughter was something that I looked forward to. When she was born, I had some very strong emotions about this child. I was filled with joy and felt protective and loving towards her. When my second child was born, I seemed to have the knack of stopping her from crying when she was in my arms, and thus I felt emotionally bonded with her too. My life and attitudes to children changed as a consequence. I worry about my children in regards to their health, emotional well-being and consider it important to teach them good values. After our children were born, I found that I participated more in the housework than I had before. With the amount of attention my children needed, my wife and I were very tired. And so I became a support for her by doing dishes, laundry, changing nappies, feeding the baby and vacuuming. Unlike my own father, who has always had a job, my children have experienced a dad, who had been employed, unemployed and a student. This has meant that there have been times when I have been able to spend a lot of time with them and others when I couldn’t. Now that I am working, it is harder for me to be involved with my children, as I only have evenings and weekends in which to accomplish everything! One of the hardest thing of being a father is to make sure I am spending time having fun with my children. Sometimes I have been more successful than others. It is very easy to spend time doing what you want to do, but I have realised that this means my children miss out on me. When I asked my children once what they thought fathers are for, they replied that they are there to teach children, look after them and to have fun with them. I have tried to teach my children a variety of different things such as learning words in other languages, about other countries and have encouraged word and math games around the table which they enjoy playing. I listen to them reading and offer them encouragement, while trying to correct them when they make mistakes, but praising them when they do something well. I also encourage them to enjoy music and dancing. I have spent a lot of time dancing with them to music and hope that I am instilling within them the confidence to try different things. They enjoy experimenting with sports equipment like throwing and catching frisbees, playing softball, and throwing, kicking and catching balls when I get time to go outside with them. Being a father in the modern world involves thinking about what is important for your children to know in order to survive in the world today. One thing that I have gained from my changing lifestyle over the last few years is, that I have been able to watch them at school athletics and been able to be a parent help with school outings. It is important that I teach them skills when I think they are ready to learn them. I have taken on some responsibility for their education in an informal and sometimes fun manner, which is different from my parents’ era, where they held the opinion that education is the schools’ job. But many parents these days get more involved with their children’s learning and help out more at schools to assist their children’s education. For me it is important that I keep the lines of communication open and talk with them. Often I have other things on my mind that I am worried about, and at those times I have to make sure that I am really listening. For me it is important that I stay interested in what they have to say and to be a source of support and encouragement. I believe that it is important to take the time out and spend time doing things that they enjoy doing. I often have in my mind that the time you have your children for is short, and that sometimes you just have to stop and enjoy them. I don’t want to have regrets later about not spending enough time with them or not investing in them. I found one of the worst things about being a father is when you have to tell them off and they start crying or take it much harder than you meant it. Discipline now is different from the 1970’s, when a smack was not considered “child abuse”. But I think that modern attitudes of reasoning or talking about their behaviour with the children has some merit. It has often worked as the children have got older and were able to understand more; but not always when they were younger. I think that if it is possible to solve a problem through discussion, then I would rather do it that way. Then there are those occasions where you tell a child off because you are tired or frustrated, rather than anything that they have done. You end up feeling guilty. I think it is important to show and tell them that you love them unconditionally. Today’s fathers roles differ from family to family. 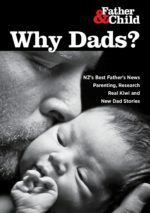 It runs the gauntlet from solo fathers to fathers who do not want to have anything to do with their children or just do not have time, because of work or other pressures. Media attention on abusive fathers has unfortunately tarred all men with the same brush, when they do not deserve it. This has shown up where male primary teachers are not supposed to touch children, and so men who are badly needed as male role models in primary schools are loathe to enter the profession because of the potential for suspicion placed on them. I have met many good fathers and so I think that it is important for people to realise that men are not all the same and that they have the ability to have a positive impact on their children lives. I find it worthwhile to listen to radio shows like ‘Focus on the Family’ for good tips on parenting. There have also been exhortations for fathers to take more notice of their children in country songs such as Reba McEntire’s ‘The greatest man I never knew lived just down the hall’. For me as a father, I find the words of this song and others like it to be pertinent and challenging but a good reminder that children are important and worth the attention. For me, if my children grow up knowing they are loved and supported and can come to me about any problem they may have, then I would be happy and feel that I had done a good job.